Tri-Fi can bring a full day of education and inspiration to your students. It’s a guest artist times three! 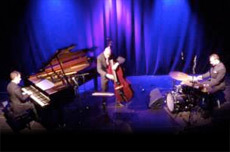 By bringing in a working piano trio that is able to function as a complete band, or work as part of a larger band, your students can learn from demonstration and from participation. 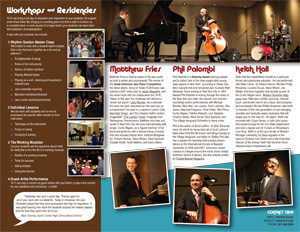 Who better to work with a student rhythm section than a trio that tours together as a trio and as sidemen? We can work with students one-on-one to emphasize the specific skills needed on their instrument. Let your students ask the questions about what it’s really like to live the life of a working musician. Tri-Fi can play a concert as guest artists with your band, or play a trio concert for your students and community – or both!